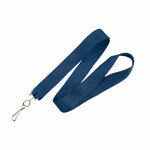 Lanyard, 3/8" Wide Breakaway Lanyard with Wide Plastic Hook. Sold in quantities of 100. Priced per 100 units. Standard Lanyard, Lanyard Custom Printed, Pink Ribbon Breast Cancer, On Pink Lanyard, 5/8 in (16 mm), Flat, 3/3 D-Sub with White Breakaway Crimp and Nps Swivel Hook. Sold in quantities of 100. Priced per 100 units. Standard Lanyard, Orange Flat Braid Breakaway Woven Lanyard with a Universal Slide Adapter & Nickel-Plated Steel Swivel Hook. Lanyard is Both Comfortable and Discreet to Wear. 3/8" (10 mm) Flat, 36" (914 mm) Cut Length Prior to Assembley. Quantity of 100. Lanyard, Standard, Black, 5/8 " Break-Away Oweave, Smart Reel with Slot Assembled. Sold in quantities of 100. Priced per 100 units. VINYL NECK STRAP, Clear 36" Neck Tube. Sold in quantities of 100. Priced per 100 units. COLORED PLASTIC BEADED NECK CHAINS, Plastic Bead Chain 4 mm Bead, 38". Sold in quantities of 500. Priced per 500 units. Standard Lanyard, Lanyard - 1/8" - Non Breakaway -Swivel Hook. Sold in quantities of 100. Priced per 100 units. Standard Lanyard, Lanyard - 1/8" - Non Breakaway -Split Ring. Sold in quantities of 100. Priced per 100 units. LANYARD STANDARD, 1/4" ROUND WITH SPLIT RING. Quantity: 100. Standard Lanyard, Lanyard - 1/8" - Non Breakaway -Clip. Sold in quantities of 100. Priced per 100 units. Standard Lanyard, Lanyard - 1/8" - Non Breakaway -Clip. Sold in quantities of 1000. Priced per 1000 units. Standard Lanyard, Black 1/8" Round Cord Lanyard with 2 Swivel Hooks - 27" Long with Crimp Finishing Option. Quantity of 100. 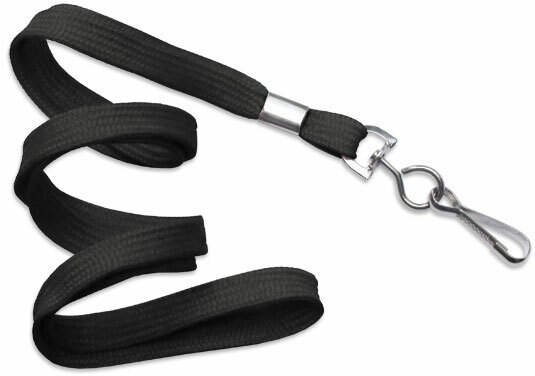 Standard Lanyard, Black 1/16" Round Cord Lanyard with Swivel Hook - 36" Long with Crimp Finishing Option. Quantity of 100. 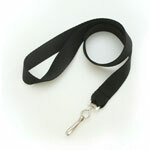 Standard Lanyard, Black 1/16" Round Cord Lanyard with Swivel Hook - 28" Long with Crimp Finishing Option. Quantity of 100. Standard Lanyard, Lanyard-3/4"Flat Poly-Swivel Hook. Sold in quantities of 100. Priced per 100 units. 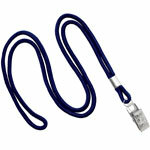 Standard Lanyard, Royal Blue 3/4" Flat Non-Breakaway Lanyard with Swivel Hook. Lanyard Comes Sewn As a Finishing Option. Quantity of 100. Standard Lanyard, Black 3/4" Flat Non-Breakaway Lanyard with Swivel Hook. Lanyard Comes Sewn As a Finishing Option. Quantity of 100. Standard Lanyard, Lanyard-3/8"Flat Poly-Swvl Hook. Sold in quantities of 100. Priced per 100 units.